It's already been more than 10 years since the horrific terrorist attacks in Mumbai, the financial capital of India. November 26-29, 2008. Four days of terror. Train stations. Cafes. Hospitals. And the opulent Taj Mahal Palace Hotel. Their actions have taken on an eerie, unanticipated resonance a decade later. This movie's U.S. release follows only days after a young Australian radical laid siege on mosques in Christchurch, New Zealand. He livestreamed his raids, which, at most recent count, have claimed 49 lives. The Taj's Master Chef tells his staff, "Guest is god." He says a VIP client will kill him if her daughter and son-in-law aren't looked after properly. The context of those words in his world offers a stark contrast of high society and the affluent compared to the vengeful actions of the attackers — ignorant of the world at large and entranced by indoor plumbing. With some 1,000 guests, it's naturally challenging to find the proper story arc and focus points. Sometimes — regardless of factuality — certain dramatic elements play out as a little manipulative (for example, a nanny tending to a crying baby while hiding in a closet as the terrorists hunt down a maid). Some of the action plays out like a classic Hollywood horror movie, but the facts remain. The horrors were real. 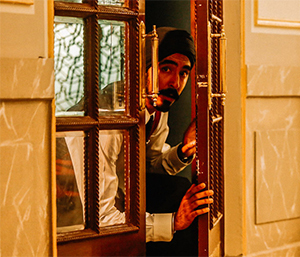 By necessity, the story relies on fictional mechanics to drive the story, but it's informed by the documentary Surviving Mumbai and archival news footage is interspersed to match up with the timeline of the overarching chaos. The story primarily follows the actions of several key characters: The meticulous head chef of the Taj, Hemant Oberoi (Anupam Kher, Silver Linings Playbook); the architect David Duncan (Armie Hammer, The Social Network) and his wife, Zahra (Nazanin Boniadi, TV's Homeland) and their nanny, Sally (Tilda Cobham-Hervey, 52 Tuesdays); an affluent and aggressive Russian named Vasili (Jason Isaacs, Harry Potter and the Chamber of Secrets); and a compassionate Taj staffer named Arjun (Dev Patel, Lion). It's all heinous, atrocious. Words are limited in describing the misplaced motivations of the young men put in service by a distant voice named "The Bull." With promises of money for their families and an eternity in paradise, they fulfill the bidding of the Bull. For some, their parents fully support their recruitment and training. They're encouraged to exact revenge on those who they perceive to have held them back from advancing in society (notably, their efforts are coordinated by way of wireless communications developed in the western world). "There's no harm in throwing grenades," the Bull advises. "These animals have no humanity," he says. There's a considerable amount of first-class filmmaking on display here, largely by rising talents. The score by Volker Bertelmann (Lion) serves as the movie's pulse, giving the overall experience a heartbeat. The cinematography by Nick Remy Matthews (The Chaperone) goes dark and grimy on the streets of Mumbai, then comes to vibrant life with the exquisite, colorful details of the Taj. And there's the intricate screenplay by John Collee (Master and Commander: The Far Side of the World) and Anthony Maras, who also makes a remarkable debut as feature-length director after a few short films with similarly world-conscious themes. As a moviegoer, it's safe to go home, to enjoy life. But then there's the haunting reality: the Taj is merely one high-profile incident. The recent events in Christchurch, along with heinous events in recent years on school grounds and summer camps; churches, synagogues and mosques; night clubs and movie theatres all convey the need for perpetual vigilance.